Hollyanne isn't quite finished with her card yet, so I'm going to post what I made to participate in All That Scraps weekly challenge. It's a sketch challenge - I love great sketches! This one I tweaked a little bit. I flipped it and brought the flowers closer together. You can see the sketch that was posted here. But I love the softness to this card - the paper is from Making Memories that I picked up at Michaels. The image is Pixie's Heidi. I don't have a favorite Pixie, I love them all. I colored her with Copics and Prismacolor markers. The sentiment is from Unity Stamps, Bevy of Butterflies. The picture lost the glittery effect in her wings, I used a Spica Glitter pen. I colored in the meadow and the sky and then used a tiny flower stamp from PTI's Ovals Borders and Corners set to stamp in the wildflowers. 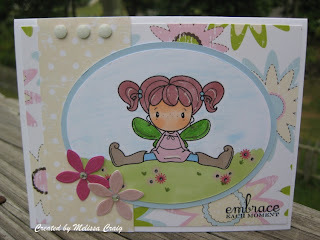 And I am sooo excited that Christine has released her new Kiki La Rue stamps. Today is Christine's birthday, so stop by and wish her a HAPPY BIRTHDAY and purchase either stamps or digi-stamps at a special birthday price. I'm anxiously awaiting my email with my digi-stamps! !